Ah, there’s nothing quite like the smell of bacon in the morning. 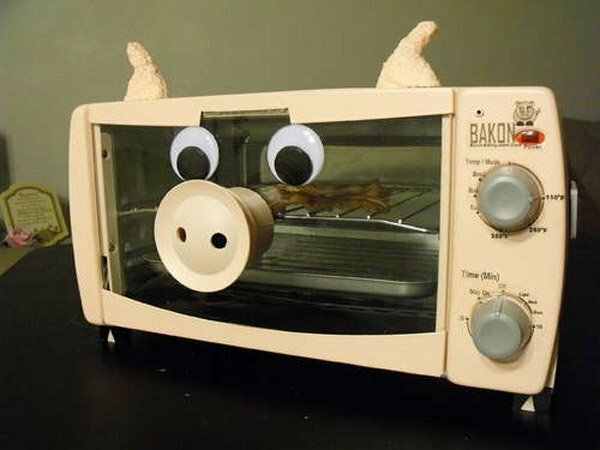 Now you can wake up every morning to the aroma of delicious crispy pig flesh, thanks to the BAKON alarm clock. Just load the BAKON clock the night before with a few strips of frozen bacon, set the alarm to 15 minutes before you want to get out of bed, and when its time to wake up the next morning, the specially-modified toaster oven cooks you a batch of the tasty stuff, filling your pad with the heavenly bacon scent, readying it for you to eat just in time. And if that’s not enough to wake you, the BAKON oven also oinks like a pig at alarm time. You can’t buy the BAKON clock in a store, but you can follow nelson8815’s build guide over on Instructables if you want to try and make one for yourself.